Although it is important to retain a New Jersey accident attorney or personal injury lawyer with trial experience, comparatively few personal injury claims are actually decided in court. More often, your attorney and the insurer for the person who caused your injury will agree on a “settlement”—an amount the insurer is willing to pay in exchange for you waiving your right to a lawsuit. Your NJ accident attorney will try to gather evidence to support a settlement that fully reimburses you for your injuries while the adjuster will try to undermine your claim and lower the settlement amount. Some of these initial steps may be entrusted to a private investigator. For example, your attorney may hire an investigator to visit the scene of your accident and take pictures or prepare diagrams. If necessary, your lawyer will also review the appropriate statutes and case law that could apply to your claim. You and your lawyer will have to agree on a settlement you are willing to accept. The choice is ultimately yours, but you should give careful consideration to your attorney’s advice, especially if there are case weaknesses you may not have considered. After you have decided on an appropriate settlement amount, your attorney will contact the insurer with a demand that is somewhat higher than this amount. Why not just lead with the minimum you are willing to accept? The insurer will rarely agree to your first demand and will probably counter with an offer that is lower than you were hoping for. If all goes well, each side will edge closer to a settlement that is mutually agreeable. If you start with your bottom line, you have no room to maneuver. While you are working towards developing an initial demand, the insurer will be preparing its side of the claim. First, a claims manager or a claims supervisor will assign your file to a claims adjuster. Smart adjusters try to contact injury victims right away, hopefully before they have talked to a New Jersey personal injury lawyer. Adjusters want you to agree to a lowball offer before you learn how much your case really might be worth. Not all adjusters resort to underhanded negotiation tactics, but enough do that it is highly advised that you hire an attorney to handle communications with the insurer on your behalf. The insurer’s investigation will try to uncover evidence that you are either fully or partly at fault for your own injuries. They will also try to uncover evidence that your injuries are not as bad as you claim. Like your attorney, the adjuster will look at your medical records, police reports, and documentation of your time lost from work. In smaller cases where the other party is clearly at fault, your case could settle as soon as a month after your first demand letter. In more complicated cases, it could take much longer. whether a third party may be responsible for your injuries. Although adjusters may initially try to rush you into a settlement without a lawyer’s involvement, once you do secure legal representation, they may start dragging their feet. They know that your financial pressures are mounting the longer they delay, especially if your injury causes you to miss work. Make sure your rights are protected by securing legal representation shortly after your injury. 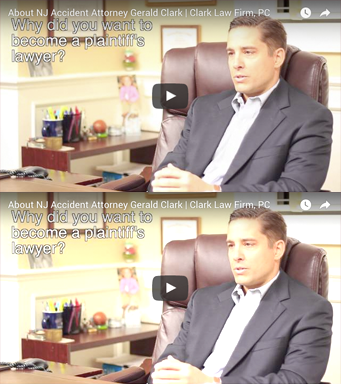 Call the Clark Law Firm, PC at (877) 841-8855 for a free case evaluation from a qualified New Jersey accident attorney.